We arrived at 9:30 a.m. on Saturday, Jan. 26, to the Three Points/Robles Junction Community Center, a scenic 25-mile drive southwest of Tucson. The crisp, 50-degree morning could not have been more agreeable for a morning highway cleanup. Melissa Owen of Rancho Sierra Vista de Sasabe was preparing an information table and off-loading three large heated containers of breakfast burritos. Four years ago, Owen made a decision to go big. She would invite the neighborhood to participate in a large-scale volunteer cleanup. The catch? Her neighborhood is a bit bigger than most. It’s the 45 miles of State Route 286 between Robles Junction/Three Points and Arizona’s border with Mexico. This year, volunteers began rolling in steadily from the Arizona Game and Fish Department, Buenos Aires National Wildlife Refuge and U.S. Customs and Border Protection Explorers program. They were signed in and, after a safety briefing, assigned a mile marker to begin cleaning up. Owen wasted no time getting everyone organized and passing out safety vests and the program’s signature blue trash bags. Before the meeting broke, I thanked Melissa for her volunteer service and the participants for their support. Melissa received an Adopt a Highway Certificate of Appreciation for 22 years of volunteer service and a hearty round of applause. The slideshow above has lots of photos from the day. As it turns out, more than just Owen’s neighbors showed up. I spoke with a couple from Oro Valley near Tucson, a friend visiting from Texas and a couple who flew in from New York to support the effort. On the way to mileposts 3 and 4, our designated spot, we stopped to talk with a few volunteers. An Explorer told me he enjoys volunteering and considers it fun. Another found a red construction flag and held it high for the group photo. A student with one group said she didn't have a paper due this weekend, so this was a good way to spend her Saturday. Volunteers found a bevy of interesting items: a Christmas elf hat, retail tags still attached; an unfinished needle-point project; and an almost perfectly intact javelina skull – not everyone’s idea of a perfect souvenir, but the finder was delighted. This was Owen’s fourth annual “All the Way to the Border” cleanup, and one thing was clear: Her dream of cleaning all 45 miles in a one-day event is quickly becoming a reality. In 2018, she had 60 volunteers who removed 80 bags worth of trash from 25 miles of roadway. This year, 70 dedicated participants collected 210 bags of trash along 31 miles. 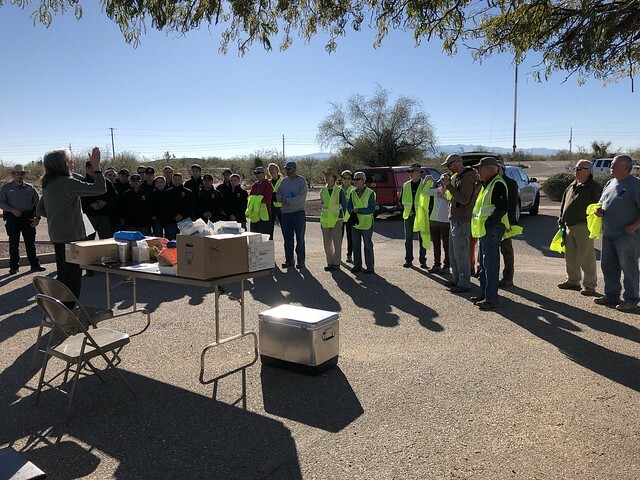 If you are interested in joining a cleanup event in your area, please contact me at mcurrie@azdot.gov. For more information about the ADOT Adopt a Highway Volunteer program please visit azdot.gov/adoptahighway. EDITOR'S NOTE: The author oversees ADOT Adopt a Highway programs.